I really go crazy over something like this in hopes it sends the right vibes . I have started faceless log angels in a woodlot to make people feel uneasy and not hunt. Have 25 now and they have weathered to a very spooky spookiness lol. This is very cool for eye brain overdrive with the forest and nature being supported . Perhaps this is the same intent. Ohhhhhh I like the spooky spookiness! I remember some of your angles pictures, I don't know if they were yours or others but very cool. I also didn't know you put them up to detour hunters, very cleaver! Do they make the hunters think people are there like scarecrows? Theses statues are at a big Buddhist temple. 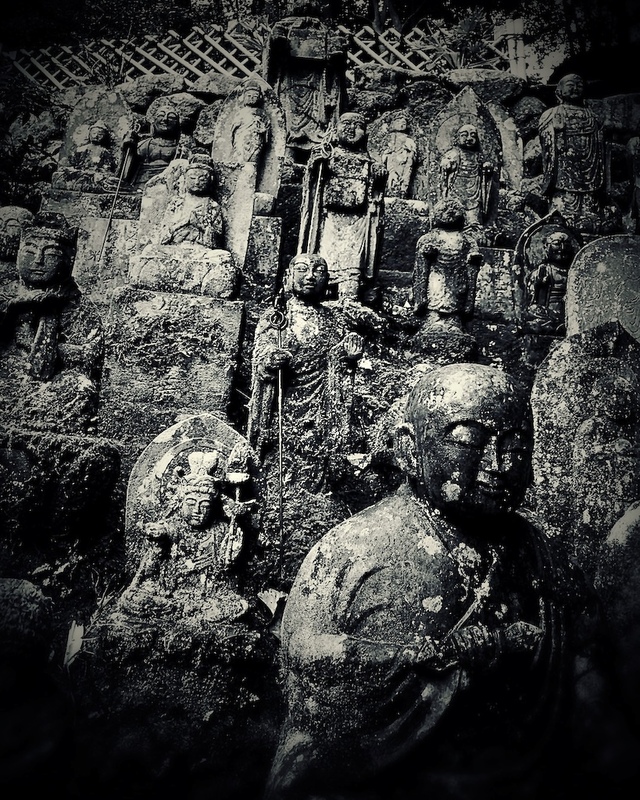 These statues represent all the spirits resting here ( all buddhist temples are also cemeteries) to create a peaceful place for soul to rest in beauty for eternity. I don't think they represent one spirt but rather all that have ever existed. Im always astonished coming here as it would take you a week to count all the statues, big and small! But in a way you are right as I think these statues looking over the mountain also are here to protect the ashes of people's bones resting here. Here is a link to someones blog that has more pictures of this temple. Does the energy that it takes to carve these give these energy? The stone statues are far more solid than a solid state drive in a computer. But the memories of that computer will be gone. It's old school but it's message stands the test of time. I would think so! There is always a very humbling feeling that overwhelms you in these temples. I would say the energy vibrance is that of peace and harmony! This is also a very fast dying art form here as well. Modern people can't put dinner on the table by carving statues! So the energy is magnified as they are sitting overlooking all that is! Powerful place! I think Jezy Urban's ears are bigger! This is a powerful spot, its a temple built on the mountain and as you hike up to the main Buddha there are thousands of these statues everywhere. I start buzzing and tingling as I walk around! Very fun for me! Its fun to go to places like this! Tons of energy in this spot, it makes your body tingle! @nikoniko: haha, can it recharge your phone too? I don't have a phone so i don't know but that being said ever time Im there my camera seems to lose battery life more than gain it! Do you have some spots like this near you too? WOW I didn't know that! Very interesting! Thank you buddy! This place is packed with these dudes, the whole mountain! @nikoniko: That is so cool. Ruins and ancient sites feel alive with joy, sorrow, as if all time is blended into one. Thats very well said, time is forever here intertwining the past and future into now! They were sitting her 10years ago watching over everyone and will be in another 10,100years too! I love that thought!